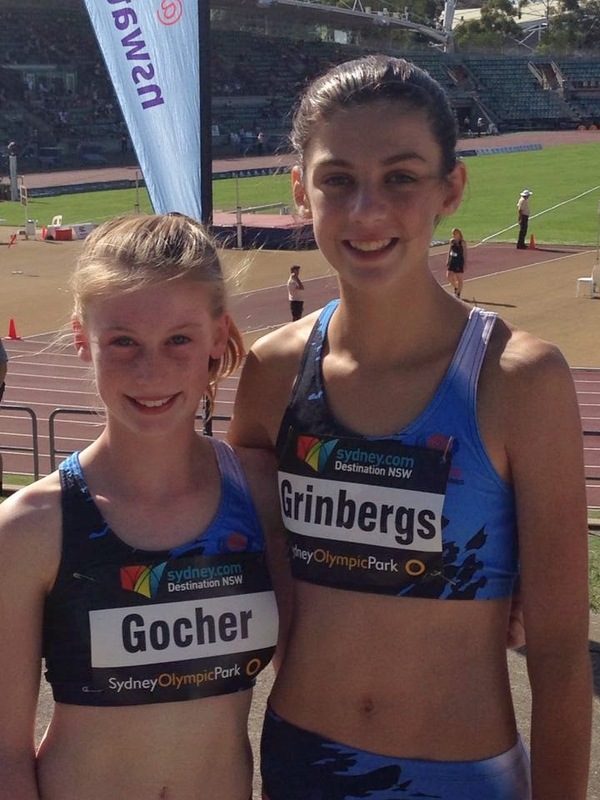 There were mixed fortunes for the 11 Junior Striders who made it to their start lines at the Australian Junior Championships held at Sydney Olympic Park. Apart from this being held at the end of a very long season, efforts were hampered by injuries and illness picked up in the run up to these Championships. However, we should remember the effort everyone put in to make it here so here’s a big well done to all Junior Striders. 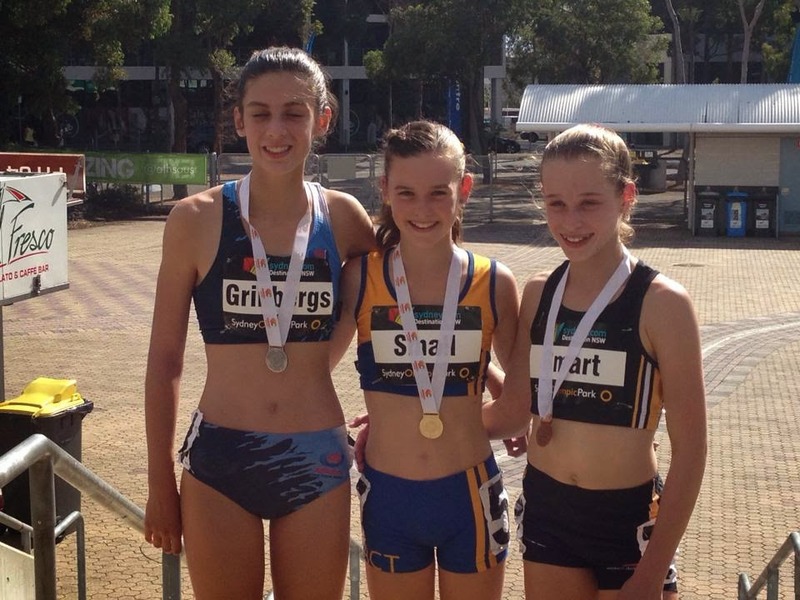 Having said that we had 2 National champions: Edita Grinbergs in the 400m and Lachlan Cooper in the 1500m. 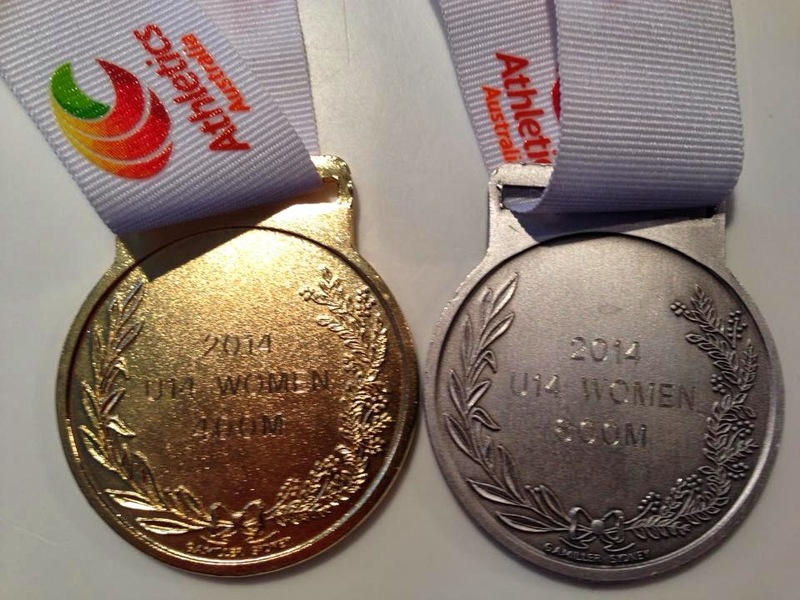 Edita also won silver in the 800m and Bethany Halmy won a bronze in the 400m relay - quite a haul. 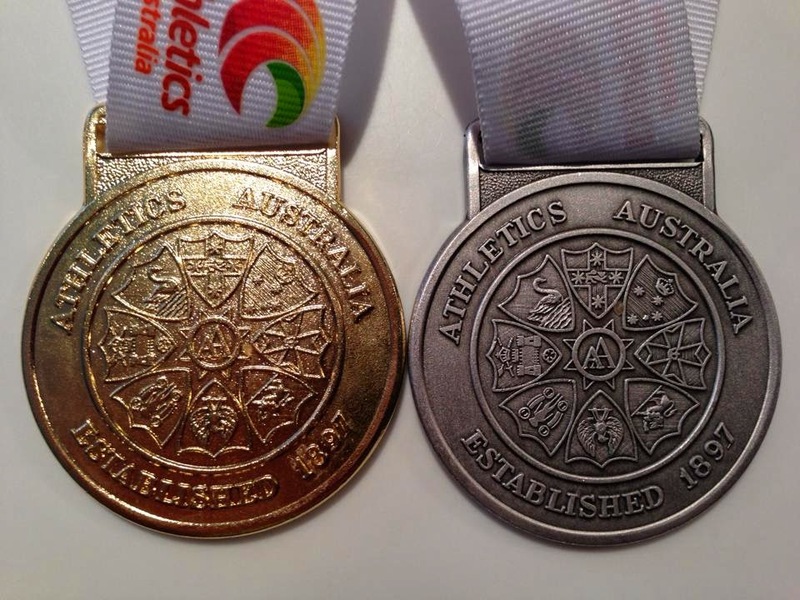 See the end of this post for a close up of what Nationals medals look like. In the 400m, Edita Grinbergs dominated the field and won our second ever gold medal in these Championships in a new junior club record of 57.57. There were solid runs in qualifying from Bethany Halmy in the under 20 girls in 58.30 (she has had some time off for her HSC) and Tessa Constantine in the under 16 girls in 59.18. 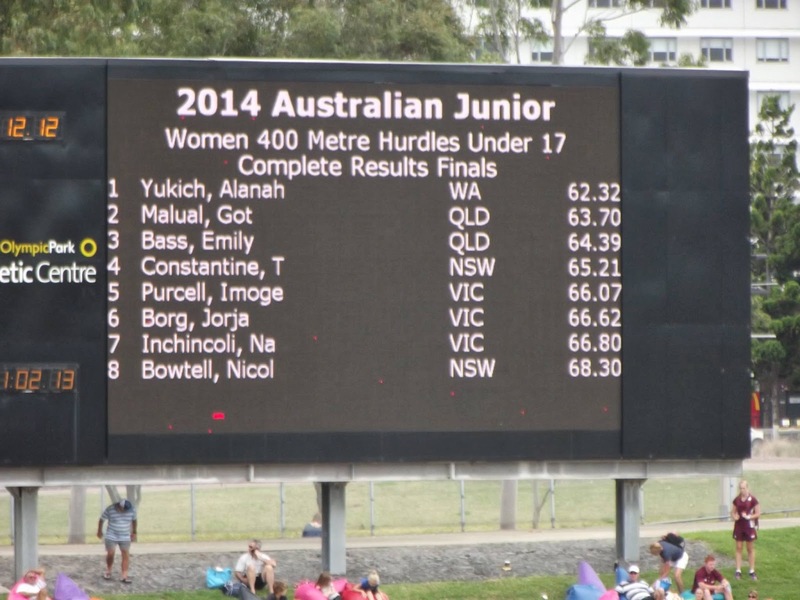 Tessa Constantine, 15, continued her success in the 400m hurdles with a 4th place in the final of the under 17 event in a time of 65.21. She has one more year in this age group. Her dad took some excellent pictures which really capture the scene. It is very professional and serious at Nationals. 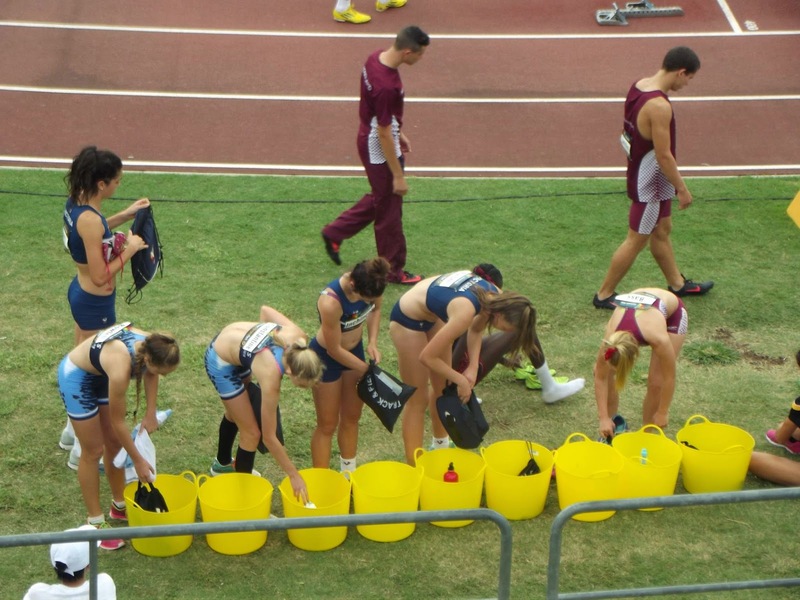 Every athlete gets to leave their stuff in their own personal basket. 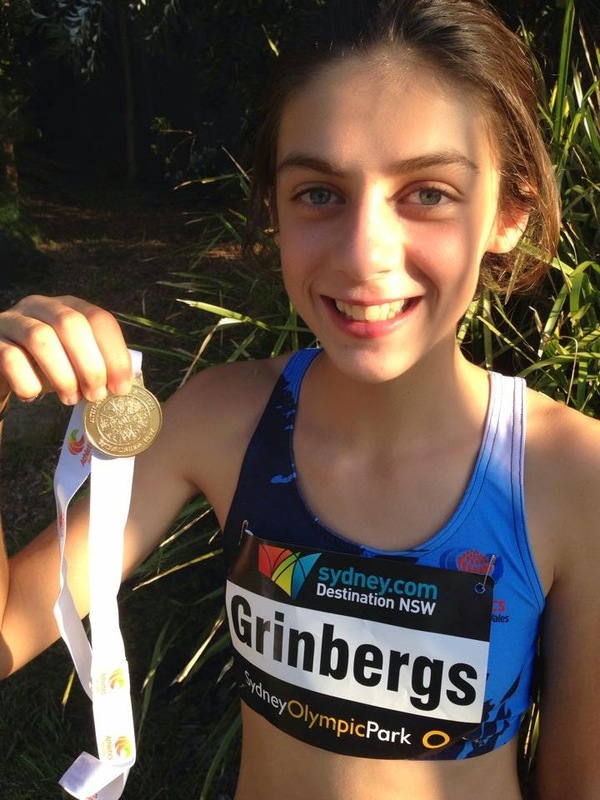 Having won the 400m, Edita Grinbergs went on to claim a silver medal in the under 14 girls 800m in a time of 2.13.24 which is also a junior club record. Bethany Halmy also ran in the 800m. Sophie Gocher came 8th in her heat of 2.26.25. Daniel Francken had a solid weekend of racing in the under 18 boys with a 9.12.44 3000m and a 4.10.02 in the final of the 1500m. 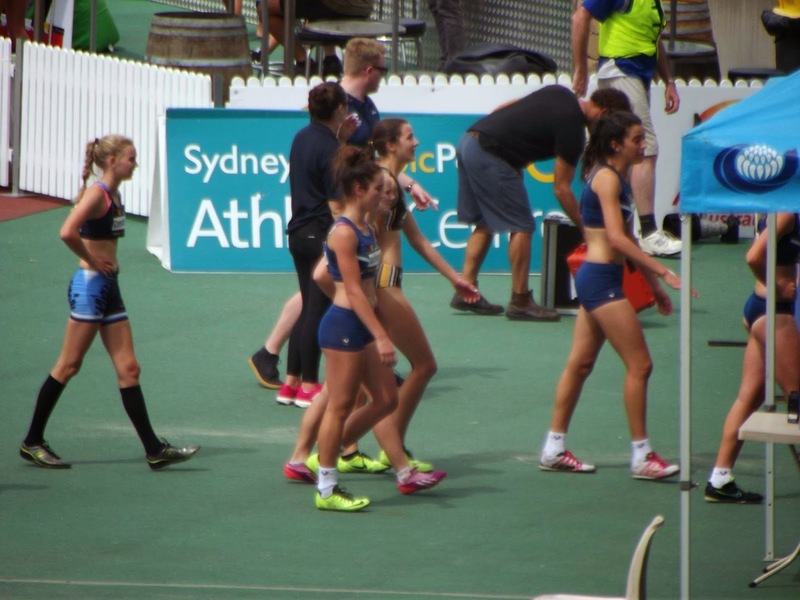 There was quite a crowd of juniors out to watch the steeplechases, as they were run just before and within the Sydney Track Classic event. 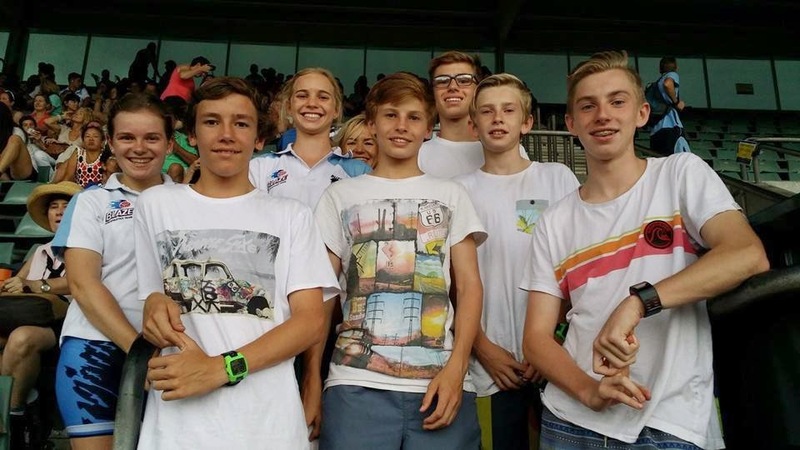 Here we have Amelia Gorman, Jack Mills, Harlan Mulhrin, Lachlan Cooper, Daniel Cooper, Tessa Constantine and Josh Phillips (Caroline Yarnell peeping through at the back). In the Steeplechases, Adam Halmy and Paul Loader were 10th and 12th in the under 18 boys 2k event. Their times were 6.42.86 and 6.54.01 while Liam Gorman, nursing an injured foot came 8th in 7.28.53. Adam was happy with his new water jump technique (looks great! ), he did manage to almost clear the water. 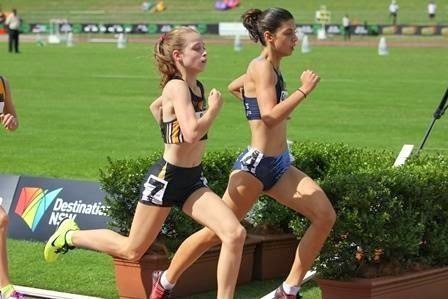 Amelia Gorman in her first year in the 3k Steeplechase came 12th in the under 20 girls’ event in a time of 12.49.46. Finally David Gardiner, having recovered from illness earlier in the week had a baptism of fire when his race was combined with the Open Men’s 3k Steeplechase in the Sydney Track Classic after the huge thunderstorm we all witnessed. He went on to finish in a new PB of 10.25.29. 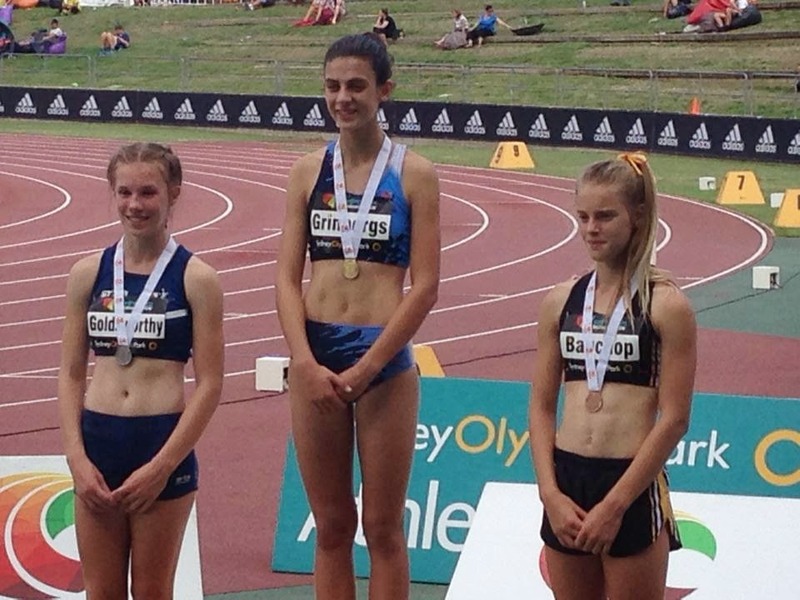 Bethany Halmy had an especially big carnival, being asked to represent the athletes at the cutting of the cake to celebrate the 20th anniversary of SOPAC opening and winning a bronze medal in the 400m relay. She only found out on the day that she would be in the 400m relay and was very excited. 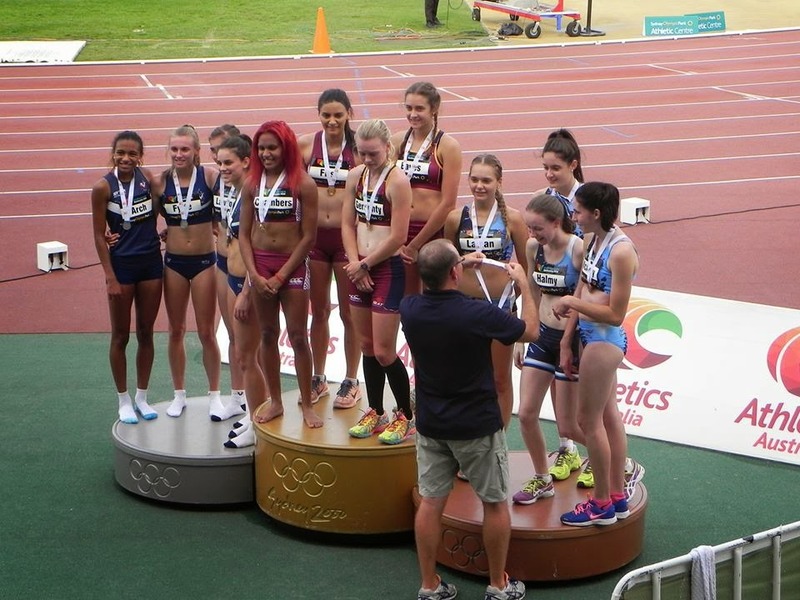 Even more excited to come away with a Nationals medal. Bethany Halmy - guess which one?